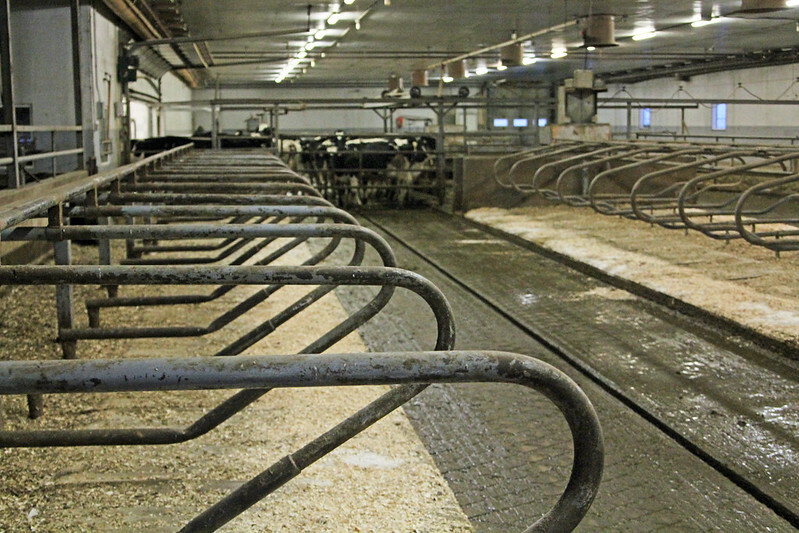 I had the privilege of touring a local dairy farm over Christmas and I learned so much from my visit. There is so much to be knowledge to be gained if we are open-minded and ask questions. It is a goal of mine for 2015 (and beyond) to tour as many farms as I possibly can, especially here in Alberta, and share my findings with you. This dairy, about a 15 minute drive from my home, milks 90 cows at a time and these cows are taken very good care of—that was very evident even in my short visit. They have fresh bedding every day, their manure is swept out twice per day and they have access to feed outside, even in the winter if it is above -12ºC and this is for their health and safety. 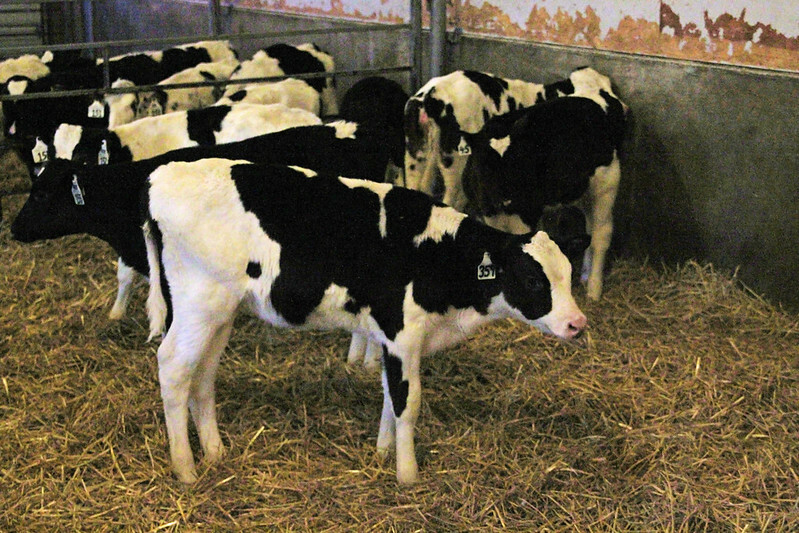 They wait to be milked and know that when the bell rings, it’s their turn to walk into the stalls to be hooked up to the milking machine. 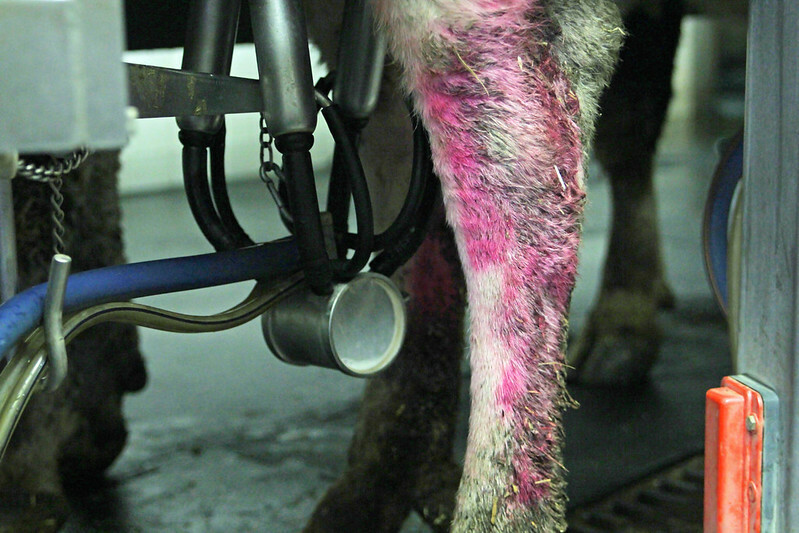 Do you have any idea why this cow’s hind legs are both painted pink? It’s because she has mastitis and is being treated with antibiotics and the paint alerts the farmer that her milk cannot be pooled with the rest of the cows. 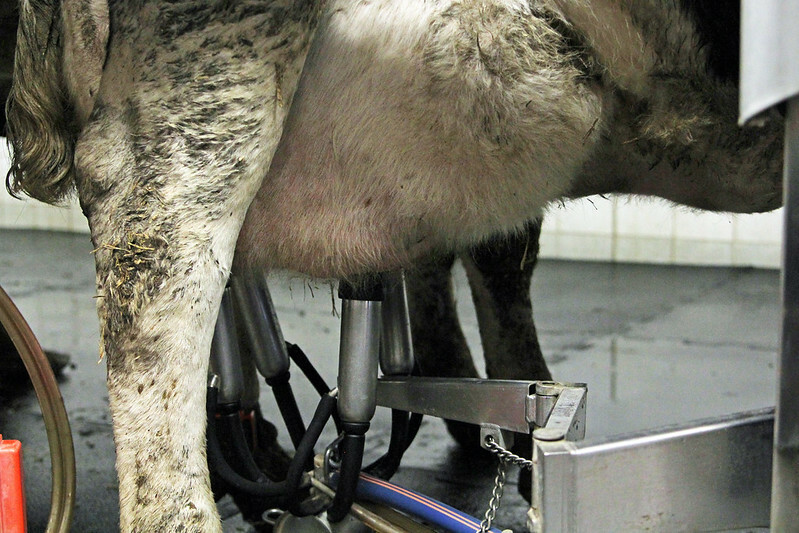 Her milk is being pumped into a jug that will be discarded until she tests free of antibiotic residues. All milk sold and consumed is antibiotic free. 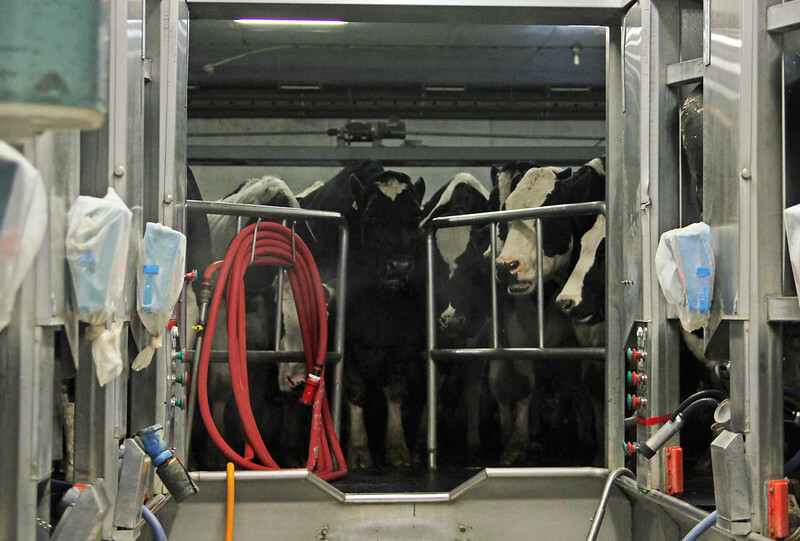 The milking lines are flushed after every milking (twice per day) and the cow’s teats are cleansed with iodine. For very detailed information on milking cows, you can read how dairy farmers milk and take care of their cows here. This machine lets the farmers know how much milk the cow is pumping. That reads 23 kilograms of milk from this one cow alone! That’s just over 50 lbs and she wasn’t finished yet! 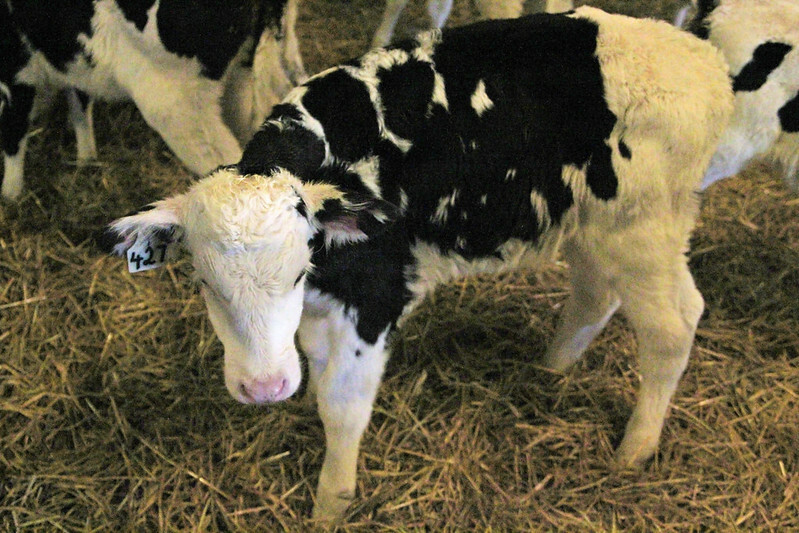 It’s just absolutely unbelievable to me as a mom who has nursed her two babies…I cannot imagine producing >100 lbs of milk per day! 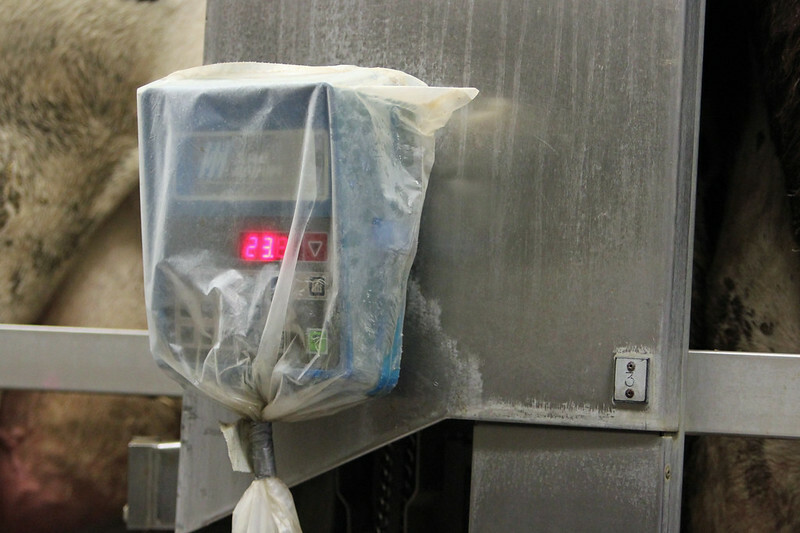 The milking machine automatically pulls off the cow when sensors signal that she’s done milking. Pretty amazing technology. We then got to tour the calf barn, which I admit was my favourite part. I have a soft spot in my heart for Holsteins, as my grandparents had a dairy operation, but also retired long before I came into the picture. It’s easy to be scared of and skeptical of things that you don’t fully understand, which is why it’s so important to critically think and seek out accurate information before judging. If you have any questions, please feel free to ask in the comments, or of course Ask the Farmers. Thanks for stopping by and commenting, Steph! I've had the privilege of touring a number of dairy farms in New York State as part of my job, but I haven't come across the legs of a cow being painted to identify it as being treated with antibiotics. Do you know if that is a standard practice, or is that something that is done on just that farm? I believe it's standard to mark the cow somehow so that they know which milk to dump from an infected cow. Maybe some add ribbons or a tie of some sort around the leg? I'll have to keep an eye out for something like that the next time I visit a dairy farm!